Check out my tips below, and see more over on the Partners Trust blog! 1. Install a towel bar to create a staging area where you can display pieces when assembling new looks or packing for a trip. This set-up works especially well for bloggers and avid instagrammers. 2. Install undermount hooks to hang larger tote bags and insert purse pillows inside of each one to help maintain their shape. 3. Use an extendable shower curtain rod in a cabinet to hang boots with boot trees. This will help keep taller boots organized while extending their life. 4. Create a hanging jewelry panel by lining a wall or panel in your closet with felt or fabric, and installing hooks to hang your longer pieces. 5. Add vinyl dry cleaning bags within your existing hamper to create separate sections for laundry, dry cleaning, and items to purge/donate. 6. Replace conventional hanging rods with battery-operated LED hanging rods to create a more boutique experience—as well as make the items in your closet more visible! 7. Create a purse changing station by organizing a drawer with compartments for pens, wallets, gum, and lip gloss to make the changing process easier. For a real overhaul, run a power strip into the back of the drawer so you can charge your electronics while keeping them tucked away out of sight. 8. Remove any odd hangers and/or change out all your hangers to be the same style and material—this is an easy upgrade that will instantly take your closet from drab to fab! 9. 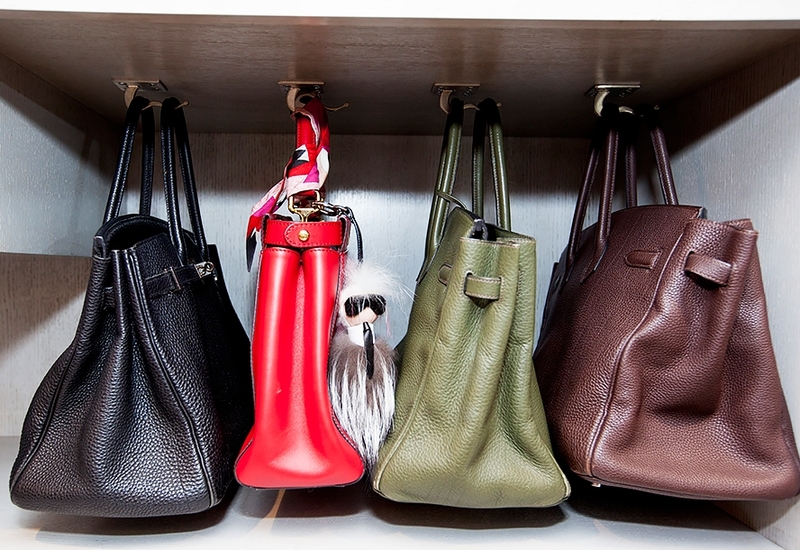 In a smaller space, use gallery ledges to store/display sunglasses, clutches and other small accessories. This will allow for easy access to your favorite pieces, without having them get lost in a deep drawer. 10. Create a 3-way mirror by installing wall mirrors on a hinge. You can incorporate a hinge on the back of any basic wall mirror, and instantly create a custom dressing space.